Concords MOST SIMPLE, MOST SECURED & MOST BEAUTIFUL MODEL UP TO DATE. The seat that grows with your child in a new way. 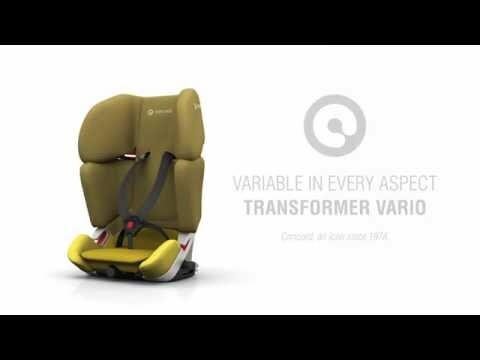 VARIO XT-5 is a new generation of seats from Concord, and comes with new technology. As our only Group I / II / III car seat, includes facility to modify the seat height for use in Group I or Group II / III as appropriate. VARIOSIZE SYSTEM: intelligent, straightforward size adjustment in Group II / III, linked to the seat height adaptation facility for Group I: - Adjustment of the headrest and shoulder protectors is automatically blocked until the seat is set at its lowest level, indicating that a move from Group I to Group II / III is required. - Radically innovative feature prevents the risk of incorrect use when switching from Group I to Group II / III.